There are bad ways to get to CES, and then there’s this — a 10-day, cross-country bike ride. It’s a week and change of 17-hour days spent peddling through zero-degree temperatures across the Midwest. Hell, it’s early January — even Las Vegas is near freezing this time of year. This is one way to put your new electric bicycle wheel through its paces ahead of launch. But more importantly, it’s a pretty solid publicity stunt, funded by Google — a company that likes making a grand entrance. It’s all part of what’s shaping up to be a pretty big push for Google Assistant at the year’s biggest consumer electronics show. Electron’s Gen 2 Wheel was actually announced a few months, and is currently up for pre-sale from the company’s site for $799 (with Best Buy availability arriving at some point in the future). The whole Google Assistant bit, however, is new for CES, and will only be available in beta when the wheel starts shipping in February. Google clearly wasn’t content with Assistant just being on phones and smart speakers, so it approached Electron as a potential partner. It’s arguably one of the most interesting implementations of the smart assistant to date, and actually makes more sense than the initial novelty of the whole thing suggests. “As we have worked with Google to integrate Assistant, it’s really made us excited about how to make the user experience as simple as possible and how voice technology can be integrated while riding,” Electron VP James Parker told TechCrunch. “There’s all of this nice command technology in cars. We think there’s so much opportunity to use that technology while riding a bike. The Electron wheel works like most other front-wheel-powered bicycle add-ons. Installation should take less than a minute according to the company, snapping the wheel onto the front spokes. 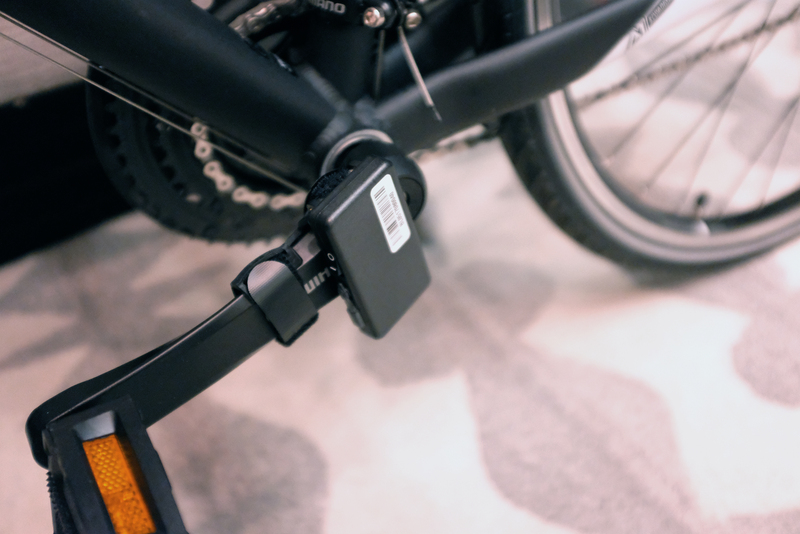 Then you secure a sensor to one of the pedals with a Velcro strap. That’s pretty much it. In default mode, the system uses an incline sensor to detect when you’re going up a hill and then kicks in to assist. You can customize the assist level through Electron’s app, but even with a handlebar mount, that’s honestly kind of of a pain. That’s where the whole Google Assistant bit comes in. There’s no microphone on board the wheel itself (perhaps there will be in some future version), so you’ll still need your microphone with earshot. 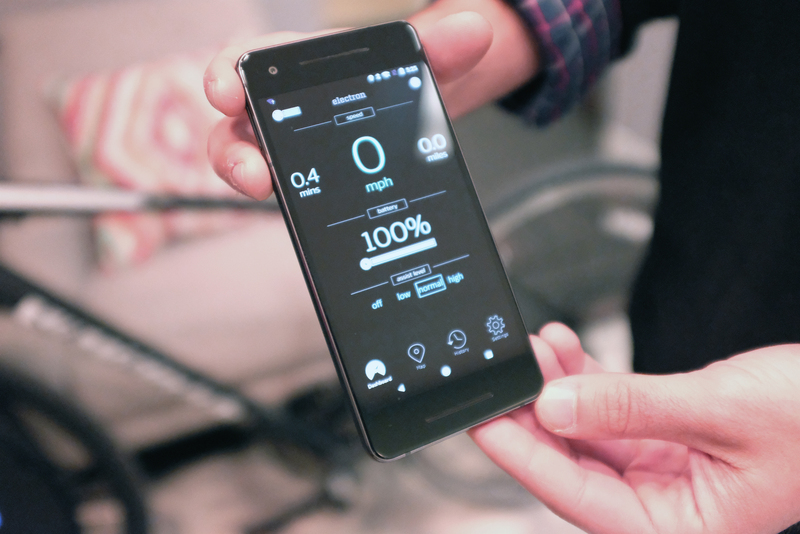 “OK Google, start bike ride” will fire up the wheel and start tracking stats through the Electron app. Beyond that, you can use Assistant to change the level of assistance, find out the wheel’s battery level and have it read out stats as you’re riding around. The wheel’s cross-country journey will kick off the morning of December 31st, with rider Max Lippe taking off from Union Square in Manhattan. He’ll ride for around 17 hours each day, before (hopefully) arriving at CES 10 days later. The wheel itself is rated at up to 50 miles on a charge, meaning the team will have to swap it out fairly regularly. To do that, a van will trail Lippe, with six wheels in tow, constantly being charged up so they’re ready to go. If all goes according to plan, he should arrive in Vegas on January 10, the second day of the show.